Our bodies need an occasional detox that will eliminate all accumulated toxins and waste and thus support the function of body organs. “Kvass” is a potent medicinal fizzy tonic with a distinct taste, traditionally consumed in Eastern Europe, and made by fermenting stale bread. It is full of nutrients and offers a myriad of health benefits. If you add the medicinal properties of beetroots to it, you will get a powerful beverage which cleanses the kidneys and the liver and improves the digestive process. Kvass originated in Russia, where it is often made with stale rye bread, and in Ukraine, people keep a bottle of beet kvass in the home and add it to soups, borscht, and vinaigrettes. The conversion of beetroot into kvass occurs in a fermentation process, which heightens its nutritional value, and adds healthy probiotic bacteria and enzymes that improve gut health. 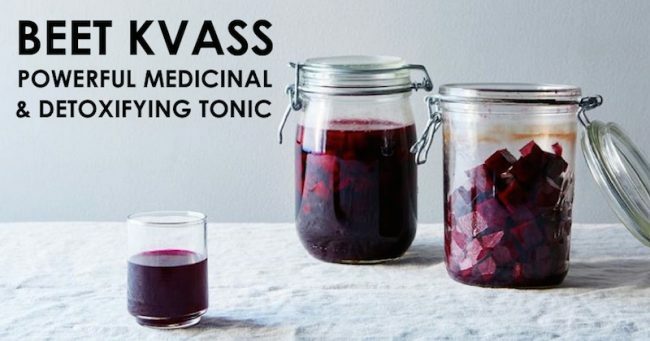 The consumption of a 4oz shot of beet kvass twice daily alkalizes and cleanses the blood, detoxifies the liver, treats kidney stones, aids digestion, promotes regularity, and treats common ailments. According to Dr. Véronique Desaulniers, the most exciting discovery about the power of beet kvass is its anti-cancer properties. It promotes healthy cellular function, chelates the body, eliminating heavy metals and toxins, as well as radiation exposure. A recent University of Michigan study found a link between healthy levels of probiotics and a healthy digestive tract to immune system function. Also, kvass is a heritage food that has been valued and used for hundreds of years, as a tonic for overall health and especially gut health. Beet kvass made has been used as a part of cancer protocols in Europe for some time now, and its benefits are now becoming popular in the United States as well. Peel the beets, wash them, and chop them into small cubes. Place the beetroot cubes in a glass jar, and pour the filtered water. Make sure you leave at least 1 inch of space at the top of the jar, add the Himalayan salt, and season. Then, cover the jar with cheesecloth, towel, or a cloth, and secure it with a rubber band. Leave the jar aside for at least 3-5 days, at room temperature, and check it daily. If you notice any scum on the top of the jar, remove it. When it becomes deep red in color, and you notice bubbles along the top of the liquid, the beet kvass is ready. Remove the cloth, close with a lid, and transfer the jar to the fridge. When it is ready, you can take 3-4 ounces of it twice daily. You will soon experience amazing health improvements!